The first time I asked a couple months ago, I got “I don’t know.” We talked about it, all the things that I do that might make him feel loved. But, they were my ideas: say I love you, hug you, smooches, meals. So, I held off for awhile before asking again to see if I’d get a different response. My son is, after all, only 3 and Baby H didn’t get asked seeing as she’s only 7 months. I wanted to see if I could get a genuine answer from him. A couple days ago, I asked again: How can I help you feel loved? I got another “I don’t know.” I asked in a different way: What does mommy do to make you feel loved? It wasn’t a long list, and some seemed insignificant to me, but the feeling was there. He felt loved by the simple things. The cuddles, our time spent together, when I help him. I asked him again today to see if I’d get different answers: “All the things I said before, Mommy.” Nothing had changed, it’s the little things that count. Especially during the holiday season, we get wrapped up in Santa, gifts, toys, and things. One simple question showed me that it’s not Santa that helps my children feel loved. It’s not the gifts or toys that helps them feel loved. It’s what I do that helps them feel loved. It’s the cuddles, the quality time, the helping. It was a nice reminder today when he asked me to play with him after school. I wanted to sit and relax, but then I remembered, he feels loved when I play with him. I want him to feel that love. So, I got on the floor and I played. 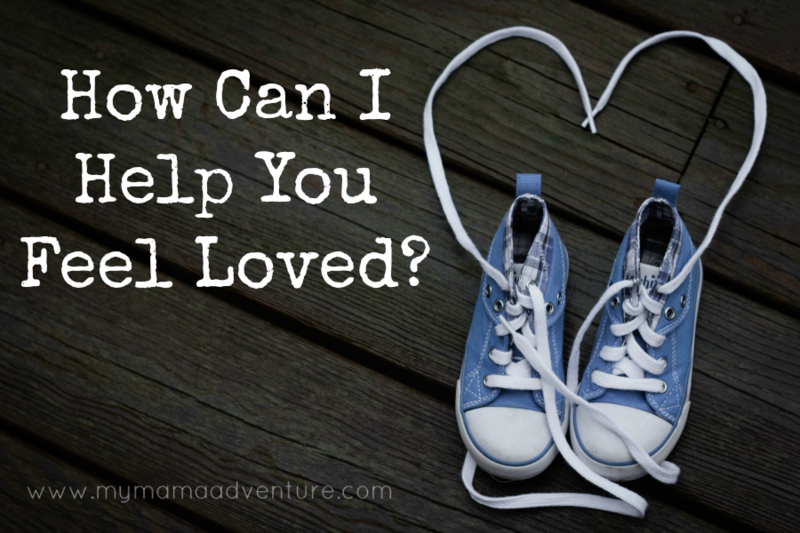 This holiday season, I challenge you, ask your kids “How can I help you feel loved?” The answers might surprise you and your reaction might surprise you even more. What was your child’s answer?